Obituary – Adams, Mary Ellen (Nida) « Perry High School Alumni Association, Inc.
Mrs. W. S. (Mary Ellen) Adams, 68, 711 Jackson street, died about 10 a.m. Sunday at Perry Memorial hospital, which she entered Jan. 12. Funeral will be at 2:30 p.m. Tuesday in the First Christian church with Rev. Michael Beasley, pastor of the church, officiating. Burial will be in Grace Hill cemetery under direction of Newton funeral home. Mr. and Mrs. Adams were taken to Perry Memorial hospital by fire department ambulance following a fire in their home Jan. 12. Adams was transferred to Enid St. Mary’s hospital, where he died the following day Mrs. Adams had been an invalid for 19 years. She was born March 16, 1905, seven miles west of Orlando to the late Mr. and Mrs. E. V. Nida. She was graduated from Perry high school in 1925. 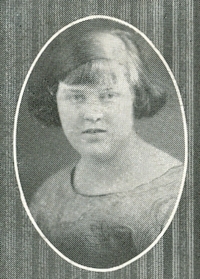 She began teaching in Noble county schools in 1926 and continued for nine years. Mrs Adams was a member of the First Christian church. Survivors include three sons, Max Adams, Norman, Robert W. Adams, Little Rock, Ark., and Merwyn Adams of Louisiana; three daughters, Mrs. Clair Seeliger, Stillwater, Mrs.Harold Doggett, Perry and Mrs.Bill Thomas, McAlester; and eleven brothers and sisters, Mrs. Raymond Klinglesmith, Mrs. Laura Kennedy, Mrs. Otto Severe, John Nida, Wayne Nida, Charles Nida and Ralph Nida, all of Perry; Elmer Nida, Orlando; Orie Nida, Muskogee; Mrs. Eda Mae McCoy of Wagoner, Okla., and Mrs. W. D. Updike of Tulsa. In addition to her husband, she was preceded in death by one son, her parents and one brother. Christian church or individuals choice. The funeral home will serve as custodian of funds.